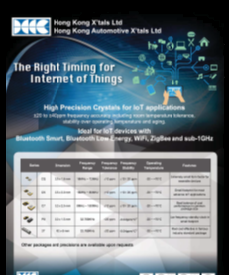 As a HK Crystal distributor, NAC offers HKC’s full offering of Quartz Crystals, Crystal Oscillators, TCXO and VCXO . HK Crystal is the brand name for Hong Kong X'Tals ltd and Hong Kong Automotive X'Tals ltd.
HKC is a division of our parent company Kolinker. Kolinker was established in 1983 to manufacture test and measurement equipment for the quartz crystals industry. The motto of the company is to act as a CORE of various up-to-date high technologies and to LINK these technologies to specific fields of industry: the CORE-LINKER, or KOLINKER. Through our continuous investment in R&D, we have successfully developed a series of high quality and innovative crystal test equipment systems and among them 6 won the Industrial Award of Hong Kong for Equipment Design. Kolinker has research papers presented in world frequency control products symposium and conferences. Kolinker is a world class, reputable and well-known name in the industry today, and you can find Kolinker equipment in almost all of the crystal manufacturers in the world.